Bestillingvare! For små kropper som aldri seiler større enn 4.7 på bølgebrettet sitt er dette løsningen. Junioravdelingen og en del av jentene i PWA dominerer waveseilingen nettop på denne nye modellen for 2019. 4x Slot Box 13 cm / 2x Choco Fins 9 cm, 2x 14 cm RTM The Grip is the ultimate all-rounder. Designed to adapt rather than to compromise. This exact shape propelled Victor Fernandez to a PWA world title. 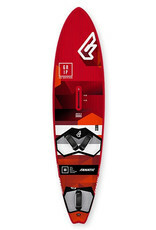 With five fin boxes and a shape designed to excel without bias in both tri-fin and quad configurations, the Grip is a champion in all conditions!The challenge was to produce a wave board that would be versatile enough to perform in everything from small onshore waves to big side-shore conditions, providing excitement and potential for an advanced rider, yet comfort and support for the less experienced.It took over two years of constant development but we finally got it nailed and when Victor Fernandez won the world title on this exact shape we knew it was something special.The Grip comes with five fin boxes for ultimate versatility. Whether, like PWA Fanatic team rider Adam Lewis, you prefer the fast, driving feel of a tri-fin or like Victor Fernandez, you prefer the more planted, controllable and loose feel of a quad, the Grip has been designed to revel in both configurations.Re-tune each time you get to the beach to maximise conditions, or simply set the fins once to match your preferred style and never touch them again. It’s up to you! Either way, you can be assured that there has never been a more adaptable yet uncompromising wave board than the Grip!New for 2019 is the Grip XS, a 60 l version with its very own rocker line especially developed for youth and lighter / smaller riders.